IDF announces name of soldier murdered in Arad terror attack, police continue searching for terrorist. 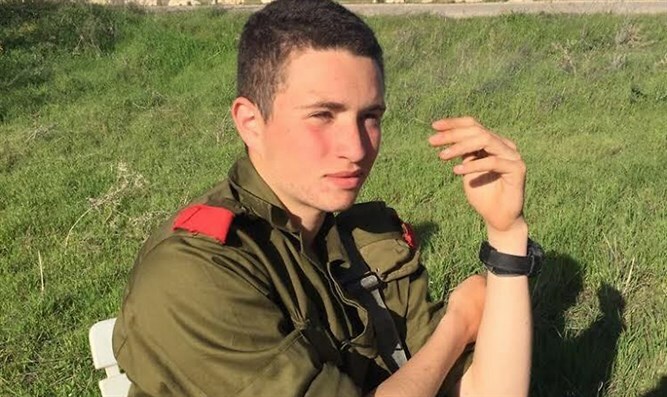 An IDF spokesman announced that the soldier stabbed and murdered in Thursday evening's terror attack was 19-year-old Ron Yitzhak Kukia from Tel Aviv. Kukia was stabbed to death at a bus stop at 9:26 p.m. in the southern Israeli town of Arad, east of Beer Sheva. His funeral will be held in the Kiryat Shaul military at 12:00p.m. on Friday. Hundreds of police officers and IDF soldiers are searching for the terrorist, who escaped after murdering Kukia and stealing his weapon. During the night, IDF and police forces searched the city, including its educational institutions, and concluded that the terrorist (or terrorists) was no longer in the area. Arad Mayor Nisan Ben-Hemo said, "During the night, reinforced military and police forces searched the city, placing special emphasis on educational institutions (which are empty at night and might serve as a hiding place from which a terrorist could continue to to kill once students arrived, ed.). After evaluating the situation, we have decided to avoid as many disruptions to routine as possible, and allow the educational system to continue functioning." "Unfortunately, Arad has now joined the cities affected by terror. We never had a nationalistic terror attack before. This ruins our pastoral quiet and the security which Arad's residents enjoyed. For years, it did not matter if there was a war or there was tension - Arad was considered to be a safe place in every way. Today, unfortunately, reality slapped us in the face." Initial investigations show Kukia was near a local mall when an Arab appeared in front of him and began stabbing his upper body. At some point, the terrorist escaped, and the soldier ran into the street to find help. Avarham, a driver who happened to be passing by, accidentally hit him and was injured. Emergency personnel soon arrived at the scene, and Magen David Adom volunteers attempted to resuscitate Kukia, but were forced to declare his death. IDF and Shabak (Israel Security Forces) are working together with Israel Police to capture the terrorist. Negev Division Police Commander Brigadier General Natan Bozna said "all the special forces were called to the scene - helicopters, dogs, officers - to try to intercept the one who harmed the soldier. We reinforced the security presence in every town in the area. We ask that everyone continue their normal routine. We will respond to any suspicious person or car immediately. I ask the public to be alert, and to call us regarding anything suspicious."